Fitting to the film’s tag line, actor Steve Pierre’s “Eric Smallhouse has gone off the reservation… way off the reservation” in the quirky indie comedy Rain in the Mountains that was penned by Joel Metlen and became the third feature directed by Metlen and his filmmaking partner Christine Sullivan. A festival favorite, the film which earned three awards as Best Feature and one for Best Comedy was also an Official Selection at the Santa Fe Film Festival before making its way to DVD. Although the film’s amateurish production coupled with some false, one-note performances (notably Seymour’s) take some of the cinematic pleasure from the movie, it’s a great effort that seemed like it would be of particular interest to film students working on making their first feature films since it never quite shakes its student film feel, despite some inventive bits of humor such as an Abbott & Costello styled routine between Eric and the local sheriff about a chopped down power pole and a likable, upbeat storyline that makes its pacific northwest setting seem like an additional character. 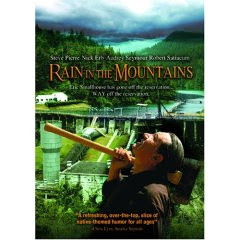 Admirably, according to IMDb, the eventual completion of the film is an inspiring achievement considering that the charismatic lead actor Steve Pierre suffered a serious stroke a full two thirds the way into the production of Rain in the Mountains.